Can an only product exfoliate, cleanse and hydrate in just one gesture? FiLabé can: it's, in fact, the revolution in skin cleansing and skin care, as the brand itself claims at least. The first time I've known of this interesting Swiss company was on Cla's blog, Glam up your Lifestyle; their new concept caught soon my attention so I was very happy and eager to review one of their products on the blog when the kindest CEO contacted me through Cla. Among the range of available products (Moisturizing, Skin Clear, Anti-Aging and Whitening), I picked the Moisturizing one and, after have daily used it for 2 weeks now, I'm ready to give you my honest feedback. First of all, how does it look? 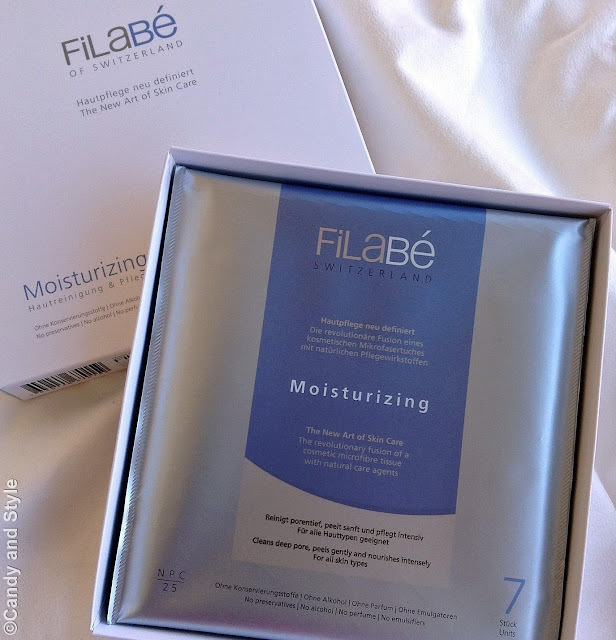 FiLaBè Moisturizing comes in a box of 4 bags each containing 7 dry disposable wipes, 100% natural and without preservative, alcohol, perfumes or emulsifiers. The dry disposable tissue needs to be moistened with water, then the fleecy side can be used on the face, gently massaging it for 45 seconds, once a day. Hope you have a good start into the week! Caspita sembra un ottimo prodotto, mi piace poter fare tutto con un unico gesto! Semplice ed efficace, sicuramente da provare! Looks like it is a very good product. Awesome review, Lilli. Per me che sono pigra il fatto che sia tre in uno e sotto forma di wipes è una mano santa, quasi quasi li prendo anche se devo guardare se ci sono come scrivi tu anche l'anti età! Molto interessante questo prodotto "tuttofare"!!!!! I would have been sceptical too but two weeks of use would have had me convienced as well. I'm glad you found this product to your liking. wow, it sounds very impressive Lilli! I'm glad it worked out for you! i prodotti svizzeri per me sono i migliori! non conoscevo questo prodotto, le tue spiegazioni sono molto chiare, lo proverò sicuramente anche perchè sono una fissata con queste cose. It's the first time when I hear about this product and I found it very interesting! Your opinions impressed me! I took a look on the site and I've noticed that theit offer has diversity, for women and for men too! Hope you'll have a great week, dear! Many, many kisses! Non conoscevo ne il prodotto nel il brand ma mi sembrano entrambi da provare. This really sounds amazing Lilli! I am already checking the website for this produkt. It sounds like a time saver, yet very effective! Kisses hun and thanks for this review! I'm glad for you, you really like the cleaning and moisture wipes. I still use the little towels and be very satisfied. Since I have a very sensitive skin, I know a beauty-product need not much ingredients, but just the rights. Tre cose in un prodotto solo? Fa decisamente per me, incostante e pigra come sono! Thank you for the honest and interesting review Lilli! This product sounds so easy to use and it's great that you've actually seen a difference in your skin Lilli! And the packaging really is perfect for taking on the go or traveling. Thanks for the intro! Have a lovely week sweetie! This product has good design and packaging inspires me confidence even though I do not know the brand, it sounds good! Happy start of week Lilli. This product definitely piqued my interest, it's different from anything that I have ever used, read or seen. How do you think it'll work on dry skin like mine? I like the sounds of it for cleansing but am really skeptical about the no need for face cream part. Also are they available worldwide? This product look fascinating. Good thing it worked well for your skin. This sounds very interesting, would like to try this product. Sounds revolutionary. Wow Lilli, this product sounds amazing. I also don't understand how a swipe could cleanse and moisturize at the same time. It's almost unbelievable. But I really believe it since it comes from you who also wondered at the same point as well. Ooh, this is a new brand to me and it sounds like a really innovative too! Non conoscevo il brand e il formato è super interessante, mi piacerebbe provarli, ho la pelle secca e mi serve una buona idratazione :) Bacioni cara Lilli ! ammetto che non lo conoscevo, ma mi pare comunque un ottimo prodotto!! Wonderful review, I`ve never heard about this product before. Thanks for this post, Lilli! It is filled with lots of information. Ecco, super adatti per una pigra come me...super pigra. Non servono quelli anti-età anche se ho 35 anni, vero? Dai dimmi di no se no mi metto a piangere. Me ne sento appena 20 sulle spalle. Wow, I've never heard of a product like this! It seems like it would be great for on the go skincare, but I feel like I would feel guilty on having to throw away the sheets right after. Love the idea though! Wow this would make some mornings really easy Lilli! Even some nights too. I'll have to keep eye out for these guys, though I doubt I'll find them on my side of the world.